Less than 24 hours after announcing they had re-signed Andrei Arlovski (pictured), the UFC wasted no time in issuing their former heavyweight champion his first assignment. 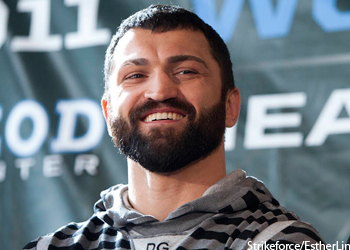 The promotion announced Friday Arlovski will meet Brendan Schaub at UFC 174. Arlovski has won six of his last eight scraps (including one no contest). “The Pit Bull” was last seen in November posting a TKO victory over Andreas Kraniotakes at Fight Nights: Battle on Nyamiha. Schaub will also be riding a two-fight winning streak into the shootout. “Thy Hybrid” bounced back from two straight losses by outpointing Lavar Johnson in a decision and submitting Matt Mitrione in September. The June 14 event takes place inside Rogers Arena in Vancouver, Canada. A flyweight title tilt between champion Demetrious Johnson and Ali Bagautinov headlines the pay-per-view broadcast.